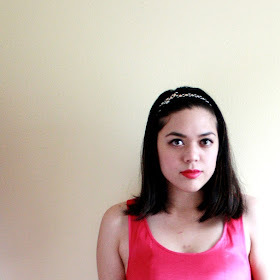 Here's what I wore to lunch with Heather. 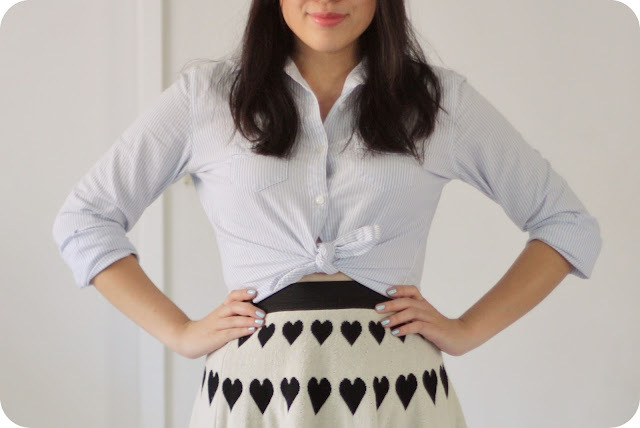 I was trying to figure out how to wear this ASOS heart skirt for summer (it's a sweater knit-type material), and paired it with one of my favorite basics--my blue and white striped button down shirt! I tied it at the waist, and voila! Instant summer. I added my favorite wedges, of course (totally not tired of wearing them at all. They're amazingly comfortable and go with everything). Also, here's Heather's outfit! I'm not sure where she got the pieces she's wearing, but they're most likely vintage (she has the best vintage stash!). I love the watermelon-y colorblocking, and the leopard print wedges--such a fun combination. Alright. I'm going to go back to streaming Dawson's Creek on Netflix. I'm almost done with second season! Haha.